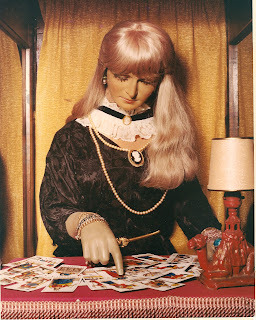 Yes, there is a mechanical clairvoyant (Wednesday calls her "our Urd") at The House on the Rock. Her name is Esmerelda; you will find her on the Streets of Yesterday where, for a small fee, she will tell your fortune just as she did for Wednesday and Shadow. Neil Gaiman will be the sole judge of the Saturday night costume contest. As this is an American Gods weekend, we encourage folks to run with the theme, but all costumes will be considered for competition, because what the hell, it’s Halloween. General judging qualifications might include attention to detail, how the costume relates to the AG/HOR/gods/mythology/other-Neil-stuff, general wit, and craftsmanship; though ultimately it’s up to Neil to decide who the winners will be. When Alex Jordan designed and built The World’s Largest Carousel thirty years ago he intended it for the viewing pleasure of his guests and never thought that anyone would ever ride it. I don’t think that Alex rode it himself; he was satisfied in his declining years to sit quietly unknown and watch visitors enjoy his work. We were delighted (as I’m sure Alex would have been) when we read Neil’s description of the Carousel and when we saw its place in the American Gods tale. What better way to celebrate the author and fans of American Gods than to let a small number of fans ride the Carousel. ----There are a certain number of restrictions including, but not limited to: open flames, weapons, smoke, and sharp projections. Other safety and security restrictions may be added to this list as we go along—we’ll keep you posted. ---To be guided to a rideable figure on the Carousel you need be able to walk up two steps and a few feet down a ramp and then be guided through a space 20 inches wide (you could move sideways) and 6 feet high. If your costume does not fit these dimensions you will need to design so that parts (for example headdresses) are removable. The rideable carousel figures will have enough headspace so that you can put your hat, or whatever, back on for your ride. Of course, we will accommodate those over six feet tall as best we can. For access and safety reasons we cannot have any long non-removeable trains on the Carousel. ---I never thought that I would hear myself say this, and I have several dead relatives who are tisking in their graves: for the Carousel ride, a certain level of sobriety will be important and may be a qualifying consideration. ---Members of the Chamber of Commerce of Spring Green, Employees of The House on the Rock Resort, Attraction, and Inn, organizing members and volunteers of the Low Key Gathering group are not eligible for the costume contest or drawing. The Low Key group is looking for panel participants. Visit the Low Key Facebook site for this and other information about the panels. Call 800-334-5275 or 608-935-3639 between 10 a.m. and 4 p.m. Central Time. Tickets are only available over the phone. Limit 4 per transaction. Tickets are nonrefundable and nontransferable. Guests must show photo ID to pick up event ticket packets. Saturday night event-only tickets (including food stations) will be $75 and will go on sale at a later date. Will there be vegetarian/vegan options at the dinner? The group I'm coming with is mostly vegetarian or allergic to milk. Thank you for your question. The House on the Rock is currently still working on the event menu and vegans will definitely be taken into consideration. More information about the menu will be provided as we get closer to the event. We've also received questions about raffle tickets for the Carousel. One raffle ticket will be included in the package price. Additional tickets will be available for purchase on the night of the party. And don't forget, the winner of the costume contest will also be getting a free ride on the Carousel. Guidelines for the costume contest have been posted. Please visit the Low Key Gathering Facebook page. A copy of the complete guidelines and other useful information about the party and gathering in general will be sent to ticket holders at a later date. Thank you for all the band suggestions we've been getting. The House on the Rock is still in the process of deciding, so keep the suggestions coming via our email, thehouseontherockblog@gmail.com. Rest assured, we will let you know when the decision has been made. To everyone who is concerned about the number of tickets left: we'll send out a heads up when the number of tickets available gets down to 100. Keep watching the blog and remember that the best way to ensure you have a place is to buy your ticket today.